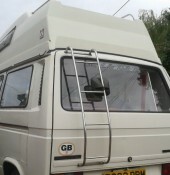 This page displays all the campervans that are available for hire in Wiltshire . If you would like further information or to speak to the camper's owner about hiring their van please visit their Camperbug page, by clicking below. I am Floydd, hire me today! Meet Floydd, if it\'s fun and adventure whilst being incredibly comfortable you want, then he\'s the van for you. Being a 4x4, you can take him almost anywhere and he will get you there safe and sound. When you have reached your destination, all you need to do is press 1 button to raise the roof then you\'re sorted, let the fun begin.!! Buddy is a diesel, five speed manual T5.1, he is fitted with a touch screen stereo that can accept mobile phones. The stereo houses 2 USB charging ports. The stereo also displays the rearview camera. Front fog lights have been fitted for your safety.